Announcing the newest product into the OutdoorHome brand. Launching into Amazon and Home Garden and Pets late November 2016. The natural way to remove mold, mildew, harmful allergens and pollutants. 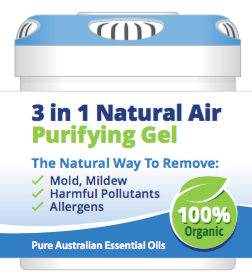 100% Organic ingredients used in a water based gel work hard to eliminate mold, and other harmful airborne microbes and allergens safely and easily. Non toxic and safe around pets and children. Home – musty rooms, closets, shoes, bathrooms, basements, kitchen, air con units, any rooms to freshen and clean the air. Car – cleans air from air con system, removes pet, tobacco or other unwanted odors. Boat – removes mold, mildew from cabin and bathroom. Eliminates musty odors. RV or Caravan – removes and freshens air in living areas and bathrooms removing mold, mildew and musty odors from being closed up. Office – sanitizes the work environment and cleans air from air con units. Removes stale, musty odors.